Japanese sweet potato fries, sprinkled with chili powder, salt, and pepper, roasted then served with a charred scallion creme fraiche. Perfect appetizer! After my trip to Minneapolis last month, I just knew remaking those amazing Japanese sweet potato fries from Young Joni would be at the top of my list. So here we are! 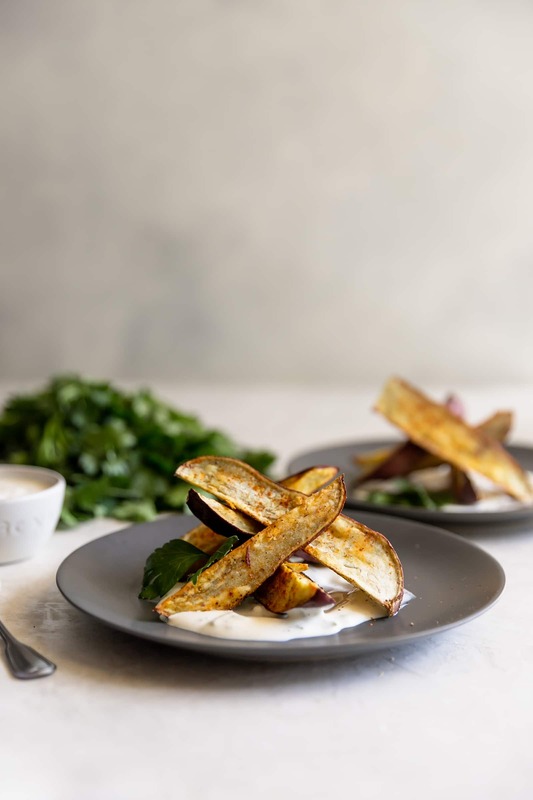 The Japanese sweet potato fries were roasted, served with a tangy creme fraiche and some other goodies however I wanted to keep it easy for you. Making these for an appetizer or a side dish has never been easier. You toss them in olive oil, chili powder (gotta love some spice! ), salt and pepper then roast for 30 minutes or so. While the sweet potatoes are roasting, you char some scallions. Yep, I said charred. Basically you cut them, place them on a skillet, and cook them until they are semi-blackened. You then mix them with sour cream, buttermilk, salt and pepper. Charred scallions gives the creme fraiche a subtle smoky touch which is perfection. What’s the difference between Japanese sweet potatoes and regular sweet potatoes? Can’t wait for you guys to try these! 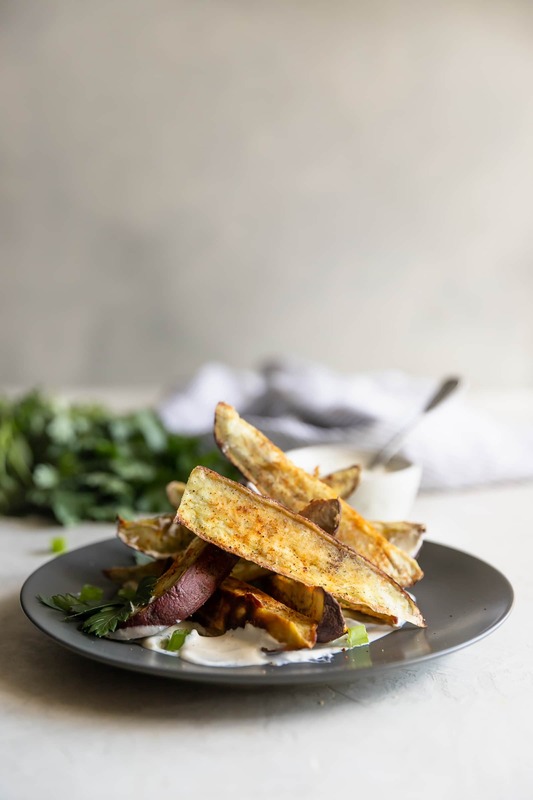 Japanese sweet potato fries, sprinkled with salt, pepper, and chili powder, roasted then served with a charred scallion creme fraiche. Perfect appetizer! Preheat oven to 400 degrees F. Line a baking sheet with parchment paper and lightly add cooking spray. Set aside. 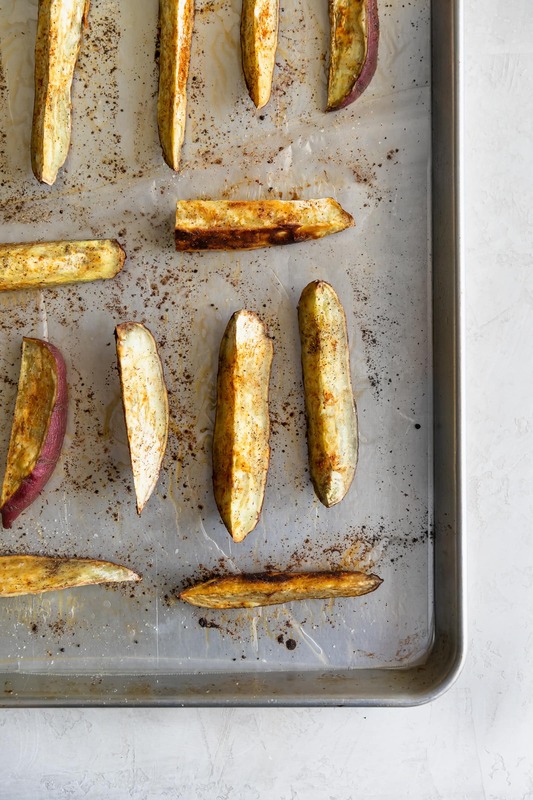 In a bowl, toss sweet potato fries with olive oil, chili powder, salt and pepper. Place on baking sheet. Bake until sweet potatoes are tender, about 25-35 minutes. Meanwhile, make the creme fraiche. In a skillet, cook scallions over high heat for 5-6 minutes, until semi-blackened, then chop coarsely. In a bowl, mix together charred scallions, sour cream, buttermilk, salt and pepper until well combined. 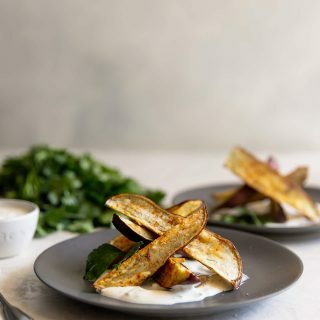 Serve Japanese sweet potato fries with creme fraiche. Enjoy! Jamie!! This looks so delicious!! I’m going hunting for Japanese sweet potatoes. These look amazing! 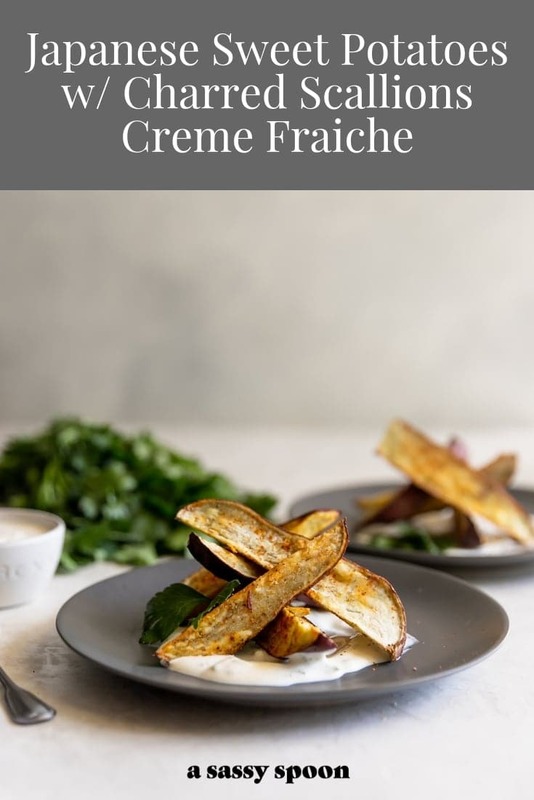 I am in love with the idea of charred scallion creme fraiche.